Home > Departments > Faculty > David Bell Ed.D. David Bell is an international and comparative educationalist and psychologist who has worked extensively in Southern Africa in the field of education, empowerment, social transformation and community development and program evaluation. Prior to moving to the United States in 1997, he worked in both formal and non-formal education and in a range of community empowerment projects and has taught in South Africa and Namibia. As a psychologist and education consultant working in an NGO (The Center for Cognitive Development) in South Africa (1991-1997) his work focused on the personal empowerment and professional training educators as agents of social and political change. He has also worked as a community empowerment consultant and facilitator for a number of national and international development community development agencies. In the U.S. he has worked at the Karuna Center for Peacebuilding, focusing on the impact and sustainability of peace-building efforts and conflict transformation programs and the efficacy of facilitated inter-ethnic deep-dialogues in Bosnia (2001). He has also worked as a consultant to the U.S. Department of Labor on issues relating to child labor and education in Southern Africa. Since 2004 he has worked as a program monitoring and evaluation consultant for a range of domestic and international organizations and agencies. Bell's early research and consulting focused on the intra-psychic processes of empowerment and social transformation and on the impact of in-service programs on educators, as agents of social transformation. His research also focused on transformational leadership and the role of historically black universities in social transformation in South Africa. His work and research has also included a focus on the reciprocal relationship between formal and nonformal teaching and learning, experiential learning, and modes of experiential and service learning. 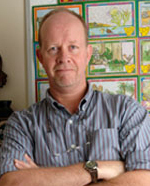 His current research and practice focuses on the social and political nexuses of education - and the issues and challenges related to international development and social change – including HIV and AIDS education policy and practice, rural education and nonformal education access and equity, and Restavek (servant children) and education access in Haiti. Most recently his work has focused on designing and conducting program evaluations. In the U.S. he focuses primarily on education programing outcomes and impacts, and globally his work includes consulting on the design and development of evaluation systems for education programs in Kenya and South Africa. David has taught, and currently teaches a range of courses including education and development, program monitoring and evaluation (introductory and advanced), qualitative research methods, international development theory, program planning design and management, participatory development practice, community development practice, participatory research and inquiry methods, community empowerment and transformation practice, education and social change, nonformal education and adult learning, and anti-oppressive education.